Pumpkin season may be nearing its end but sandwich season is year-round, and today the food item is getting it's due credit with National Sandwich Day. Here are seven places to celebrate while stuffing your face on the cheap. Quizno's: Snag an 8-inch sub for $5, just don't forget the coupon . Schlotzsky’s: Get a free medium sandwich when you order another of equal or lesser value. This a great buy one, get one free deal so why not take a friend? (Or eat both yourself — we won't judge). Jersey Mike's Subs: Get $2 off any regular sub with this coupon . Potbelly Sandwich Shop: Sign up for Potbelly Perks and get a free entree salad or sandwich this weekend with the purchase of a kids meal. Erbert & Gerbert’s: Score 50 percent off all sandwiches 2-6 p.m. on Saturday. McAlister's Deli: One of the most classic sandwiches to ever enter the handheld food arena — the club — is only $4 at McAlister's on Saturday. 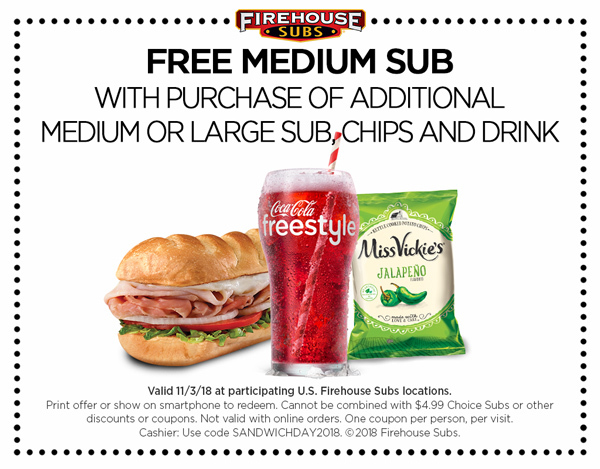 Firehouse Subs: Get a free medium sub when you buy a medium or large sub, chips and a drink. Get the coupon here . Susan Gonzalez is a digital producer and reporter for the Scripps national team. Follow her on Twitter @TheNewsan .